For the second year in a row I was out at my deer camp alone heading into Veteran’s Day. For years this was the week that every bunk was taken and there was usually a waiting list should a vacancy crop up! But, the years had taken their toll on the crew that used to fill this simple cabin in the north woods. Pop had passed away several years ago. Uncle Don who usually accompanied Pop up here hadn’t been here since then. Advancing years, two artificial knees, and without Pop it wouldn’t be the same… Without Uncle Don, that meant no Bird or Mag either. Rich had taken a job out of state so his hunting days in New York were limited. Those days were spent at “The 3 Shoe’s”, the cabin Pop had built back in the 60’s. Which meant that was where Boo & Jamie were and Big Dave... just sort of drifted away. Nobody really knows what’s going on with him. I hope he’s all right. I always liked him and he never really said goodbye to anyone that I know of. There’s no doubt that “The 3 Shoe’s” is a much more “comfortable” camp. And when the guys want to have a reunion that is the place to be! More comfortable bunks, electricity, a fridge, dish TV with all the football games, and a deck with a “hundred mile view”! A GREAT place for grilling, drinking, and catching up on everything that’s happened since last year. But, I haven’t given up hunting yet and in my opinion, there’s no comparison which cabin holds the edge there. When I go into the woods up on Donnerville Road I expect to see a deer, or two, or three every single time I venture out and THAT is what gets me up and out there. Down at “The Shoe’s”, one hopes that maybe today will be the day that you see something... anything. That is what leads to the lethargy that has become prevalent there. It’s perfectly understandable. Go a season without seeing a deer, then two... it becomes much easier to stay up an extra hour or two pounding the beers, watching the ball games, then sleeping in. After a half-hearted hour in the woods, thoughts turn to what will be going on the grill this afternoon and once the grill gets fired up, well maybe a beer. Finally the afternoon is spent toasting “past” achievements 'til the cycle repeats itself all over again. Hell, I ENJOY my time there early in the season! The woods are ablaze in fall’s colors. I haven’t seen “my brothers” in months. Let’s celebrate! But, when October turns to November and the bucks' necks start to swell, it’s at the “Little Green Camp” that I’ll be found! So here I am, Sunday evening, November 10. The camp is toasty warm and I’m enjoying an evening meal of spaghetti with meat sauce and garlic toast. I glance at Pop’s old hunting coat hangin’ from the peg near the woodstove. I decide to take the Marlin .35 tomorrow morning. It isn’t Pop’s Marlin, but I bought one years ago because that’s what Pop used, and he knocked down a lot of bucks with it. I won’t be hunting near the “Sky-Stand”, that’s where Pop always hunted. It was his favorite watch. When he had just a few days to live he whispered to me,“I wish I could have just one more day up at your Sky-Stand." So tomorrow, his favorite day, I’ll leave that area to him. I’ll start off with a morning watch a few hundred yards away up on a ridge near a cut across it's spine. I was pretty sure that was a buck that busted me up there a few days ago. With my decision made I prepare to get a good night’s sleep. I like to get up early when I know I’m going to spend a full day in the woods. I’ll fix some bacon and eggs to go with plenty of coffee before I venture out on another Veteran’s Day at The Little Green Camp. darkness. I don’t need a flashlight. I’ve been hunting these woods for twenty years. Its cold and I notice we got a dusting of snow. This could be a good day! When I reach the ledgerock in the trail, I hold my hand up high and “flick my Bic”, noting the direction the flame takes indicating where the wind is going. I decide to loop around from the north as I approach the ridge so as not to announce my presence. As I prepare my watch by kicking out some leaves so I can move my feet quietly, I note how they are frosty/frozen and very noisy. I like that on a morning watch. Any approaching deer will be heard from quite a ways off. I know that when I want to still hunt later, the late morning sun will have thawed them out, leaving them soggy for a few hours before they dry, so I can move around quietly for a little while. All signs are pointing to a very enjoyable day. I decided to send Rich a picture and text message. He knew this day was important to me. The time was 7:28 a.m. He responded promptly telling me to enjoy the day. The woods were very quiet for awhile. The birds hadn’t awoken yet. The sky still dark grey. Finally I heard something rustling. The first woods mouse was busy under some leaves twenty yards away. At 7:58 a.m. 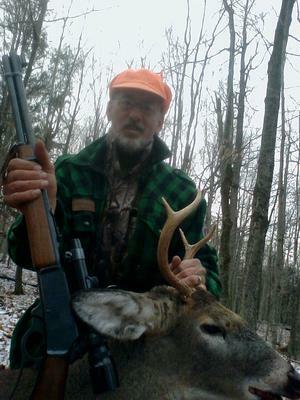 I send Rich the first picture message with me and my buck. WOW! What a series of events. Everything happened so quickly. As soon as I’d hit “send” I’d heard the deer coming. He was coming from behind me in a hurry. I glanced back and saw him coming. Head and neck stretched out and making a beeline on a course that would have him pass very near me. I immediately see the antlers with forks on each side. My mind is made up instantly and I crouch behind the tree my back had been resting against and draw back the hammer on the Marlin. The buck passes 25 yards from me and I bring the rifle up as he passes. He is oblivious to all around him, obviously being testosterone driven and only focused on what’s directly in front of him. I think I could have been doing jumping jacks in a Santa Claus outfit and he wouldn’t have seen me! After taking some time to compose myself, I approach my buck and decide to take a few pictures. Again I sit back and reflect on this amazing Veteran’s Day. I remember past Veteran’s Days like the one where I took my big 10 pointer, still the nicest rack taken from this camp, (Rich’s Snow Buck was the heaviest). Pop was here that day with Uncle Don. I recall thinking that Pop is probably here today too. I take my time cleaning out my buck and prepare for the chore of transporting him back to camp. I’m in no hurry, my tag is filled and I am going to savor every moment of this day. I find a suitable piece of branch to serve as a handle and loop my short rope around his antlers, attach it, and start my journey back... tonight I’ll have a toast to this day, this buck, this camp and... Pop.